We chatted with a kind-hearted and accomplished founder and CEO of Star Mountain Capital Brett Hickey, who took a community of care culture from a small town in Northern Canada and translated it meaningfully and with purpose to create one of the leading lower middle-market investment firms in New York City. On the surface, it may seem contradictory for a guy who made his success on Wall Street to say that the best performers are those who have a higher purpose other than financial success. This seeming contradiction is however, what makes Brett Hickey, the person, and his raison de vivre, delightfully intriguing. Raised by his school teacher dad, after his mother passed away from cancer when he was six years old, Hickey says growing up in a 10,000-people town gave him the fortitude to dream big. He did not want a life of hard labour, as is typical in a lot of small northern Canadian towns, and says he viewed education as a pathway to a different life. “Passion, discipline, perseverance and organisation, these are hard things to teach, but they are the largest determinants of success. Some may call it ‘grit’. Technical skills are far easier to learn. The lesson from my own life is that while many people grow up with money, there are alternate paths you can go down to achieve your own success. Ultimately, I’m just a guy that tries to remove excuses by creating a plan and executing against it knowing that nothing is one hundred or zero percent probable. I was from a small town with no money and I achieved my dreams, so I hope my story inspires others to pursue their dreams,” says Hickey. As a young Canadian gold medalist in speed skating, Hickey credits his earlier years’ training experiences with the skating team and community as being a major influence on his focus and drive, as well as his personal values and conduct. “Skating was very formative for me. I got into speed skating because of my dad and it really just came down to culture. In our small town hockey was the main thing and speed skating was a smaller sport, but dad loved the people and the sense of community. This really became the theme of my life – people first. In speed skating, it’s a very different type of dynamic. It really came down to culture. No one gets into speed skating because they’re going to make a ton of money! Growing up in a small town, I knew that if I was kind to my neighbour, it was in my best interest. We all have better lives when we share and work together as a community. I never understood why it would be different in business. Community and culture is everything,” says Hickey. After working on oil drilling rigs to save money for college, Hickey completed his undergraduate degree in finance and accounting at McGill University. He joined the Young Presidents’ Organisation in 2008 and says this experience gave him valuable insights, and helped Hickey build trusted relationships with his peers. This ultimately influenced his decision to participate in the Owner President Management Program at Harvard Business School where he lived on campus with over one hundred business leaders for three weeks a year, over three years, which eventually led to the birth of Star Mountain. 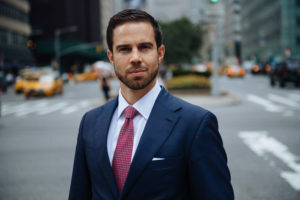 Moving to New York City in 2002, Hickey started his Wall Street career at Salomon Smith Barney (now Citigroup Global Markets) in investment banking. Working with some of the world’s leading financial institutions as his clients, Hickey says he was fortunate to be involved in some high profile transactions, including the USD 16 billion triangle merger of Travelers and St. Paul insurance companies with Nuveen Asset Management. By 25, Hickey left to launch his first small business focussed private investment fund, raising just over USD 20 million. From these learnings, Hickey founded Star Mountain Capital in 2010, with a dream to create an investment firm that was strongly differentiated through its team, culture and tech. According to Hickey, the lower middle-market was the last inefficient frontier of investing in established businesses, creating opportunities to make attractive absolute and risk-adjusted returns in a repeatable process. Brett Hickey in New York City, July 2017. All images by Jiyang Chen. 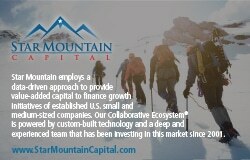 “Star Mountain’s mission is to create superior risk-adjusted financial returns for investors and to also create substantial positive economic impact and job creation by investing in and helping build smaller businesses. We made it very clear in our mission statement, that we aim to invest in the growth engine of America – which are small businesses. It feels great to be able to achieve both objectives and I believe our purpose-driven culture is one of our leading competitive advantages,” says Hickey. According to U.S. Census Bureau data, employer firms with fewer than 500 workers employed 48.4 percent of private sector payrolls in 2011, and employer firms with fewer than 100 workers employed 34.3 percent, and those with less than 20 workers employed 17.6 percent. In 2012, there were 5.73 million employer firms in the U.S. Firms with fewer than 500 workers accounted for 99.7 percent of those businesses. According to a January 2012 report from US Small Business & Entrepreneurship Council Office of Advocacy found that “Small businesses continue to be incubators for innovation and employment growth…. Small businesses continue to play a vital role in the economy of the United States. They produced 46 percent of the private non-farm GDP in 2008 (the most recent year for which source data is available), compared with 48 percent in 2002”. For Hickey, business-for-purpose is at the heart of his work/life philosophy. An earnest philanthropist, Hickey wanted to achieve a maximum return for his effort, namely, helping others achieve their objectives while growing a successful for-profit enterprise. To this end, Hickey founded Star Mountain Charitable Foundation, with a said focus on improving lives through job creation and economic development – particularly for transitioning mothers, veterans and professional athletes into employment. According to the US Department of Labor, as of 2016, almost 47 percent of U.S. workers are women. Women own close to 10 million businesses, accounting for USD1.4 trillion in receipts. Mothers are the primary or sole earners for 40 percent of households with children under 18 today, compared with 11 percent in 1960. Seventy percent of mothers with children under 18 participate in the labor force, with over 75 percent employed full-time. In November 2015, the federal Bureau of Labor Statistics found that veterans had a lower unemployment rate at 3.6 percent than Americans overall, who faced a rate of about 5 percent. Female veterans tend to continue their service in the labor force: About 3 out of 10 serve their country as government workers. This reflects ongoing efforts to train members of the military with valuable job skills before they join the workforce, new initiatives by businesses and nonprofits to get veterans jobs and the changing attitudes on the value that former service members bring to the workforce. “Over ninety percent of businesses in the US are small to medium businesses that generally and systematically do not have any way of engaging with high quality talent, such as veterans and return-to-work mothers. Historically, only large companies, like JP Morgan have really been able to cater to these talent pools and it’s hard to get in. The Star Mountain Charitable Foundation acts as a hub to create SMB opportunities for veterans and mums returning to work,” says Hickey. Currently, the project Veteran Jobs Mission spearheaded by JP Morgan Chase is one of a few major financial corporates that is comprised of a coalition of more than 200 private-sector businesses that has a collective goal of hiring one million veterans. According to Hickey, business-for-purpose is far more mainstream than ten years ago. When he started Star Mountain Capital, he says he kept his charitable foundation initially under the Availor brand (until rebranding it last year to Star Mountain Charitable Foundation), as he was concerned that investors may view his approach as ‘too fluffy’ if there was a social mission so clearly tied to the for-profit investment business. After generating some very attractive returns and respected investors, Hickey says he had the courage to unveil the alignment between his for-profit and non-profit enterprises. “I think having a higher purpose culture is extremely valuable. I had to think through many challenges in scaling an investment business focussed on smaller, more labour-intensive companies and bringing large market expertise to small businesses. I also wanted to build the business in a way that made me proud of what I was doing and ensure I would love coming to work every day. It took me a year and half to create the business plan, with a lot of assistance from Harvard professors, friends and business owners – some of which I’m proud to say are investors, advisors or partners with me at Star Mountain. It wasn’t just about identifying market opportunities, I wanted to develop a truly leading culture and team, because I believe the team is the single most important asset of any business. Many of the titans in the private equity space such as Blackstone, KKR and Goldman Sachs, were built in a different area, and have developed leading businesses that we do not want to compete against – investing in larger companies. In our asset class, we really do not have a lot of replicas to follow, which is a challenge, but an inherent opportunity. I took a step back and looked at which companies had created the most substantial economic value, which seemed to continue to be scalable, sustainable business models with substantial competitive advantages. These tended to be tech companies with strong and distinct cultures such as FaceBook and Google. So we emulated those things that are not traditionally embedded in the financial sector,” says Hickey. Some of these learnings Hickey adopted ranged from early investments in tech and culture, including standing desks, fresh food delivered daily and 100 percent of employees’ participation in the carried interest profit-sharing of Star Mountain’s investments. “I have been told by many innovators that when one paves a new path, there will be skeptics, and there were. I have had to push hard through many obstacles and I am fortunate to have built a loyal team and partners who see the value we are creating together as aligned partners. I am also fortunate to have had some early investors who believed in us, allowing us to now validate our thesis with tangible financial results,” says Hickey. Broadly speaking, Hickey believes that when people have the support they need to develop prosperity this has a positive impact on the individual and a tremendous ripple effect for the broader community. “We believe job creation is where we can drive the biggest impact in terms of assisting the largest number of people as possible. We feel we are well positioned with our for-profit business to assist with our charitable foundation’s goals. We can partner with our small business portfolio companies and help them find valuable employees through our foundation, so it’s very complementary. I have always been a believer that to have a fulfilling life, it’s really about how to make your life beneficial to others. We are not simply investing in trading stocks, we are investing in helping grow private small businesses, even if it’s small, like educating an SMB on governance, diversity and recycling plans. That may sound basic, but when it’s done at scale, that has a meaningful level of positive impact, which further drives culture. Good culture attracts better talent. Better talent produces a better financial result. I believe the highest-level performers want to have a purpose other than financial, where they want to accomplish something greater than themselves,” says Hickey. To accomplish a higher-purpose, Hickey says that innovative and differentiated top performing companies have driven teams that share an aligned purpose. To create the best team, Hickey felt he had to create a great corporate culture. One way Hickey aligns the individual goal with the corporate objective is to create financial alignment first. “One hundred percent of our employees receive equity in our business. Everyone cares about their career, financial reward, growth, but they may not have an incentive to think as a team, so financial alignment behooves everyone. Good management skills can be hard to find on Wall Street. People running private equity firms are often former investment bankers, lawyers and private investors who rise to management positions because they are the best deal makers. This is great, but those skills do not necessarily correlate to great management. We have clearly defined investors who want to be investors and not managers and others who want to be managers. I think people should focus working on their core competencies because it usually means they like doing it. Trying to force roles is not good for culture or results. Our Chairman, Brian Finn, often says that his least favourite role was his largest, as Co-President of Credit Suisse First Boston. Brian likes to be creative, build businesses and make investments, not manage large groups of people and administration. People need to be excited about what they do. When I see someone has multiple titles like CEO, Chairman and CIO, I ask myself, how can they do all of them well? Each is a full time role. If I ever see that I know it means they can’t delegate authority and that’s a problem. I know my skill is being a motivator and building teams. My job is to simply build the best team because the best team always wins,” says Hickey. To build the best team, Hickey says that it’s important to go beyond superficial diversity. For him, surface differences are not diversity, rather, it’s unpacking what each individual brings to the table in terms of background, experience, education and personal perspectives. “The best person for a role is really relative to the rest of the team, and the short and long-term goals of the company, which is challenging because both are not static. We have a dynamic human resource model where people are re-evaluated periodically to make sure their roles are best suited to their skills and personality – so the growth pattern is aligned both personally and for the company. We have an active HR Advisory committee, with sub-committees around talent areas. Each has an alignment of interest, so they are motivated to sign, analyse, develop and retain the highest quality team as possible. It’s never just about having high quality candidates – if they can’t work together effectively they will never win…Hockey teams in the NHL often have the most talented teams that do not win the Stanley Cup because it’s about the dynamics of the best complementary skills. It is no different in business,” says Hickey. For Hickey, the challenge is the long term cycle of investing where he wants his team committed across the duration; so he looks for people who have a commitment to things that don’t necessarily have an immediate financial gain or reward for them, which may include volunteering, involvement with their worship, community or civic activity. Given Hickey’s own belief in the importance of aligning a higher purpose with one’s own livelihood, it makes sense that he seeks this attribute in others. “My belief is that there is a correlation between people who are willing to give back and be selfless with people who are willing to stick through and do the right thing for our investors in challenging times. I don’t tell people that’s how I vet them, but it is part of the process, to see how they are engaged in their community, that they serve a higher purpose beyond themselves. I have found that those type of people have more dedication. If you’ve already made the decision that you’re going to give back and make a difference to other people’s lives you have some sense of duty and obligation. In challenging times, my hope is that that same feeling of duty and obligation to do right by others, will come through, because it’s a part of your DNA. That’s a big reason why we focus on higher purpose. 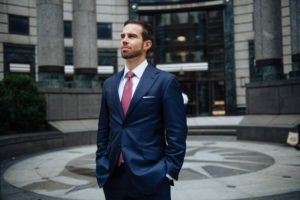 On Wall Street, you can find people jumping around from job to job, but as fiduciaries, as long-term investors, we need to ensure we have a team that are disciplined, loyal and who stand behind our investors in tough times and not abandon ship when it all gets too hard,” says Hickey.